Reality by Rach : Are the Golden Globes REALLY an Indication of what's to come at this years' Oscars?? 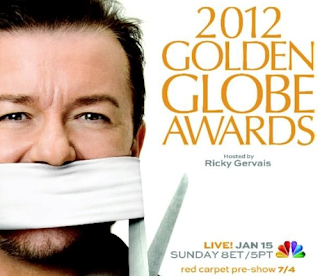 Are the Golden Globes REALLY an Indication of what's to come at this years' Oscars?? So I may be a little late with bringing up the 2012 Golden Globes but I just wanted to get a few comments in and give you guys a chance to take a look at the Winner's so that we have something to go by when the Oscars air this year I'm so excited I feel like making a little bracket and setting it up like 'March Madness' to see if I can come even close to guessing the big winner's at the 2012 Oscars (yup, I'm a nerd!). Recently having seen Moneyball, I must say, I thought Brad Pitt had a pretty wonderful performance although many would argue that Michael Fassbender should take that honor with his performance in Shame. And I think that Michelle Williams should definitely win best female performance for her role as Marilyn Monroe in My Week with Marilyn (plus she's just so damn adorable!). Lastly, as for best picture that will most likely go to The Artist but I would definitely love to see 50/50 or Dragon Tattoo take that honor, but that's just wishful thinking. **List of Winners after the jump! Tilda Swinton, "We Need to Talk About Kevin"
Viggo Mortensen, "A Dangerous Method"
George Clooney, "The Ides of March"
George Clooney, Grant Heslov, Beau Willimon - "The Ides of March"
Alexander Payne, Nat Faxon, Jim Rash - "The Descendants"
Steven Zaillian, Aaron Sorkin - "Moneyball"
Ludovic Bource - "The Artist"
Trent Reznor, Atticus Ross - "The Girl With the Dragon Tattoo"
John Williams - "War Horse"
William Hurt, "Too Big to Fail"
Evan Rachel Wood, "Mildred Pierce"
Paul Giamatti, "Too Big to Fail"